The Mensa member, who sits on Thanet District Council, is said to have denied she was being racist, citing her non-white friends as evidence. 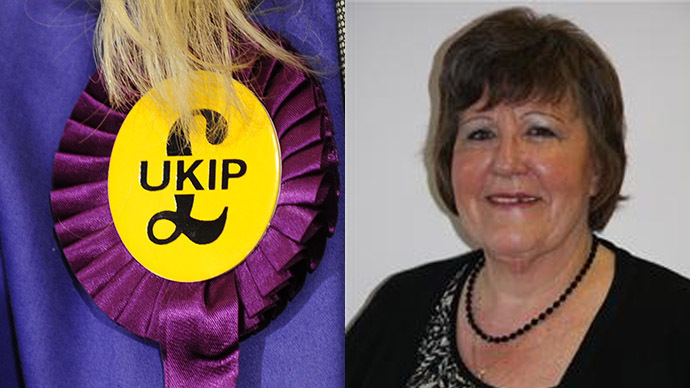 According to one account, Rozanne Duncan made the comments to the BBC during the filming of a documentary about South Thanet in Kent, where UKIP leader Nigel Farage will stand as an MP in May’s general election. Duncan, who is a landlord of several properties in Margate, Kent, has been a councilor since May 2013. News of Duncan’s expulsion was made public in a statement by the party last December, but both Duncan and UKIP refused to divulge any details. An undisclosed source told KentOnline the remarks were “jaw dropping,” fuelling much speculation as to what she had actually said. Duncan, 68, allegedly sought to explain herself, claiming she had only known white people when she was younger. She is said to have argued she is “not a racist” because she had “many Asian shopkeeper and local business friends. According to The Times, Duncan, a former member of the Conservative Party, feels she was treated “very badly” by UKIP, as she hadn’t been contacted by the party before it decided to expel her. She also said her remarks had not been conveyed to the party in context, the Times reports. A UKIP spokesman said the party was “shocked and appalled” by the alleged comments. “As soon as we were made aware of them we took immediate action to expel her from the party,” he said. The revelations will add fuel to accusations of racism made against UKIP after similar scandals in recent months. Kerry Smith was: “Loutish in what he said and is not fit to be a parliamentary candidate, but I don’t think there was anything malicious or evil about what he was trying to do,” Farage said. The UKIP leader added that people who live in London are ‘snobbish’ about such language, which is common among people who live in council homes.